One issue that becomes apparent right away is what an employer brand is and whether a company has an official, formal one. While 59% of respondents to Brandemix’s survey said their company had an articulated employer brand, only 27% of BLR’s respondents said so. I think this disparity can be blamed on some executives, especially outside of HR, not being clear on what an employer brand is, or how it differentiates from a consumer-facing brand. Another range of responses, but probably because of different corporate philosophies rather than confusion. In Universum’s survey, 60% of CEOs said they “owned” employer branding, while a majority of talent acquisition executives said that HR owned it. Marketing executives were split, with 40% saying HR owned the role and 40% saying the CEO owned it. 58% of BLR’s respondents said HR was responsible for employer branding, with 25% naming “Other,” naming such positions as Social Media Strategist, Community Relations Manager, and Communications Manager. Organizations are using an employer brand to address a large number of challenges. In our survey, the top two goals for an employer brand were “Recognition as an employer of choice” and “Ease in attracting candidates.” The top for Universum’s respondents were filling positions in the short and long terms, followed by “Improving retention” and “Differentiation ourselves from the competition.” While 69% of BLR’s respondents said that filling job openings was the main objective, 41% said it was also to “raise the company’s profile among consumers.” BLR also discussed what it called “internal branding,” aimed at employees instead of job-seekers (a distinction most companies don’t make), whose most popular goals were to raise employee engagement (66%) and increase retention (58%). It’s evident that strong employer brands do more than simply fill open positions: They speak not just to job-seekers but also to current employees and even consumers. They set the company apart from its competitors, increase worker engagement, and improve retention. Futurestep’s survey found that the qualities that provided the best competitive advantage were organizational culture (63%) and employer brand (26%). Of course, job-seekers won’t know about the former without the latter. In BLR’s survey, 48% of respondents said their employer brand was either “very” or “somewhat” successful in boosting employee morale. 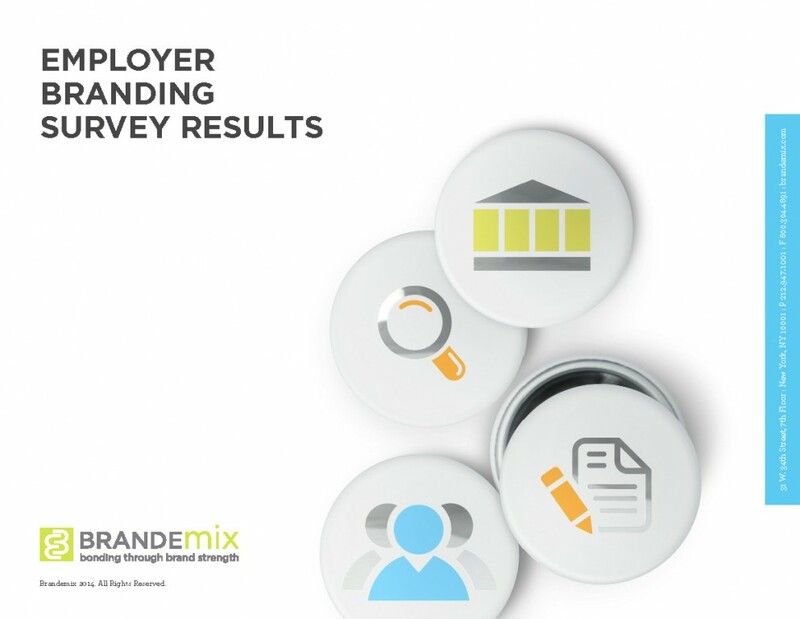 80% of larger companies and an amazing 91% of smaller companies in the Brandemix survey said their employer brand was successful. Our survey found that success was was linked to both “hard” metrics like increased applications and career site traffic and “soft” metrics like higher employee engagement and better quality of hire. A recent LinkedIn report showed that companies with a strong employer brand have a turnover rate 28% lower than companies with a weak or non-existent one. The Brandemix survey found that 22% respondents who didn’t have a formal employer brand intended to create one within the next year. PwC’s Global CEO Survey found that 93% of CEOs say they must change their recruiting strategy to attract and retain talent, but 61% say they haven’t taken any steps to do so. Add to these intentions the fact the job market continues to improve, with an unemployment rate last month of just 5.3%, and LinkedIn’s finding that only 30% of the global workforce is actively looking for new opportunities. It looks like the competition for talent is going to increase, making a strong employer brand — or an updated one — a necessity for every organization. Ready to create or improve your employer brand to better compete in the marketplace and attract your ideal candidates? Brandemix makes it easy to get started with our Rapid-Cycle Talent Branding, which will furnish your organization with a real and compelling brand framework, articulating the benefits and realities of your culture and business objectives. Learn more here.